Visitors can tour hilltop Hearst Castle, see hulking elephant seals at Piedras Blancas, relax in the sleepy beach towns of Cayucos and Morro Bay, or find some action in college-town San Luis Obispo. 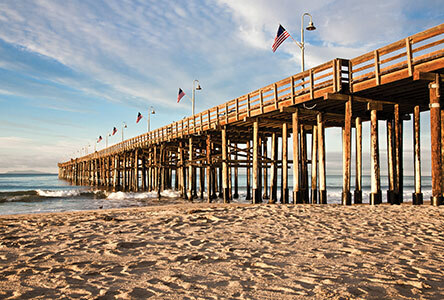 Fresh seafood often tastes best with a view of the ocean, and the old-fashioned piers of Avila Beach and Pismo Beach are ideal spots to take that meal break. Ventura’s Mission San Buenaventura is the last of the California missions founded by Junipero Serra. The oceanside town is also a jumping-off point for adventures in Channel Islands National Park, called “California’s Galapagos,” with tide pools, kelp forests and unique flora and fauna species.